Memory card readers used to be a pretty simple technology. You plug in your memory card, connect the USB and you’re free to transfer files back and forth as you see fit. However, this technology has come a long way. Modern storage cards are extremely fast. They’re speedy enough that using a simple USB 2.0 slot will leave you wanting more. As our digital media becomes more and more advanced, high speed memory card readers are becoming a necessity. With Cannons latest 5D, 4k video requires Gigabytes of data even for a short video. Why would anyone want to sit around and wait for hours just to transfer a quick video? With a high speed memory card reader, you can have access to your files in minutes. If you’re shopping for a memory card reader online, you know that there are literally hundreds of options. However, many of the readers sold today are nothing more than rehashes of last year’s technology. If you’re looking for something that is modern and up to date, one of these modern memory card readers is sure to solve all of your high speed data transfer needs. 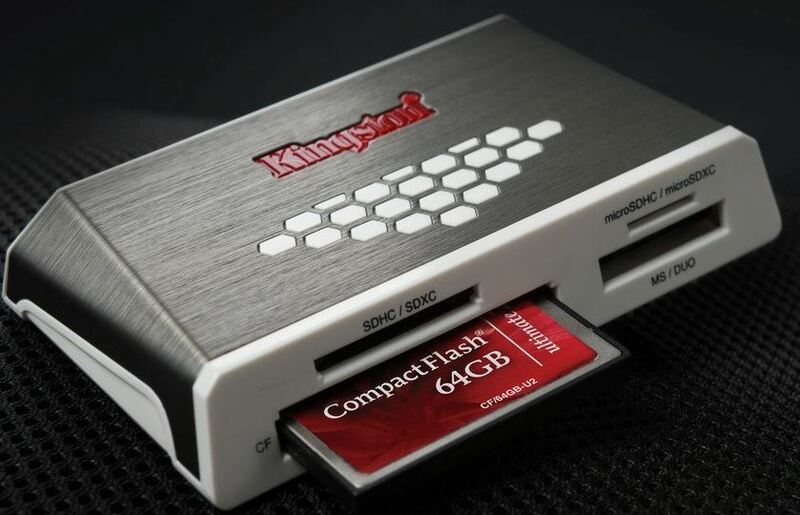 Ever since flash drives first hit the market, Kingston has been a market leader in portable storage technology. From flash memory to external hard drives to volatile RAM, they make virtually everything under the sun. Kingston tends to cater to the high end market. Sure, they have some affordable options. However, they have rarely released anything that didn’t offer competitive speed for the time. If you’re looking for a memory card reader that does it all, Kingston’s Hi-Speed Media Reader is the one. The front has four slots for different types of memory cards. The top two slots are for SD cards. It supports both SDHC and SDXC, as well as the micro varieties of each. Many memory card readers only give you one slot, and expect you to keep an adapter for using the micro cards. Thanks to the mobile revolution, MicroSD cards are more popular than ever. Since most clients will be using the micro version, it’s not reasonable to expect users to carry around an adapter that’s roughly the size of their thumbnail just to use the most popular memory card format. The SD format is fully backwards compatible with all older versions of the SD card. This means you can use vintage cards as small as 16MB. If you’re on the cutting edge, this reader will be able to support all future cards up to the theoretical maximum of 2TB. The reader also supports popular compact flash cards. These cards are not quite as common as they used to be, but can still be found in high end photography and video equipment. At the moment, the maximum supported size for CF cards is 512 GB. However, these cards have the drive controller built right into the card, so it’s possible this reader can still support higher capacity cards in the future. As a nice little bonus, the reader also supports Memory Stick cards. These cards are not as common as they used to be, but a lot of specialized equipment requires them. This has made Memory Stick readers particularly hard to find, and the fact that Kingston didn’t ignore the format shows that they are well aware of current marketplace trends. This reader supports the latest UHS-I and UHS-II speed standards. This is spec 4.00 of the SD bus, and generally only reserved for the highest end SD cards. These cards can support a snappy 312 MB/S transfer rate – comparable to many common SSDs on the market. If you have no need for these high speed cards, there is no need to fret. The reader still supports all previous SD standards. There is one common issue with USB devices. Because they are a buffered format, data does not simply transfer in a linear fashion. A device that is rated for 300MB/s, for example, will transfer this data for a few seconds and then require a pause while it re-buffers. Often you’ll see a memory card reader that is rated for a USB transfer rate comparable to the SD card read speed, so you think that everything is fine. However, in the real world, you find that your performance is worse than you expect. Fortunately, Kingston was able to resolve this problem simply by building the reader to handle much higher USB throughput than it’s read rate. A USB rating of 5 GB/s means that you’ll always be able to get the maximum speed out of your memory cards. 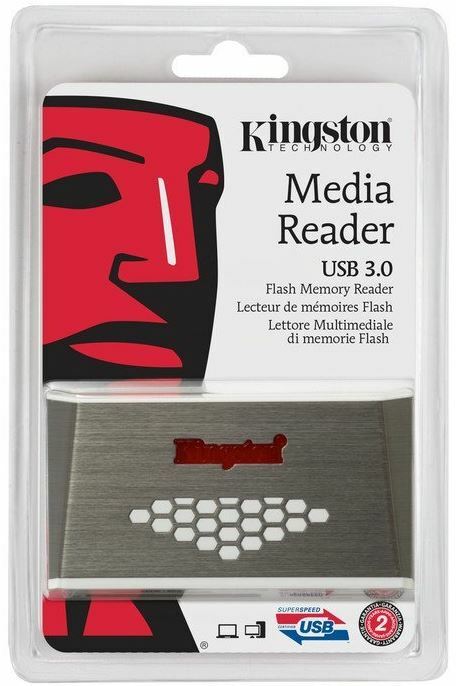 The Kingston Hi-Speed Media Reader is one flashy looking device. The brushed aluminum casing would have already been attractive enough for us, but Kingston had to take it to the next level with a cool looking honeycomb silk screen. The red logo and sharp, beveled edges certainly give it a look of authority not often found in such utilitarian devices. Speaking of utilitarian, this card reader is super easy to use. All of the cards plug into the front, so you’re not reaching around to try and figure out which hole to shove your card into. The USB cable is removable, so it’s easy to pack up and move when you’re on the go. 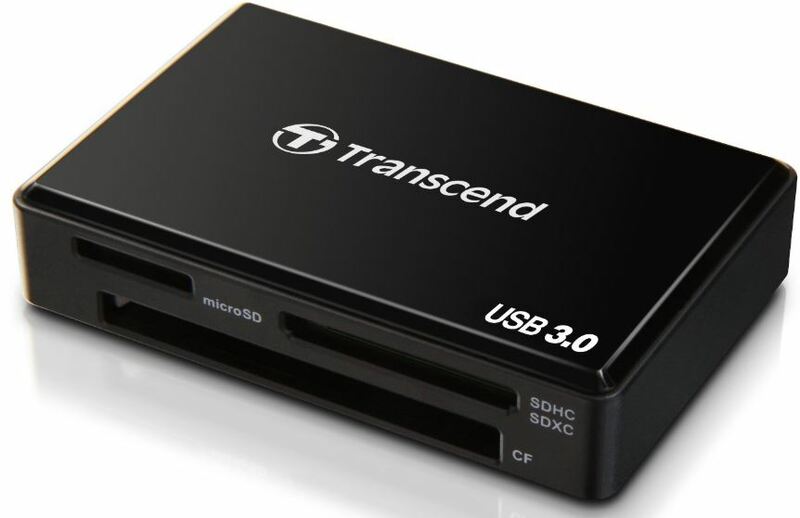 Another company you’ll recognize from the face of your pen drive is Transcend. Unlike Kingston’s offerings, which tend to be overkill for the average consumer, Transcend tends to focus on value. Their Multi-Card Reader brings value in droves, with every common feature you need for a price you can afford. 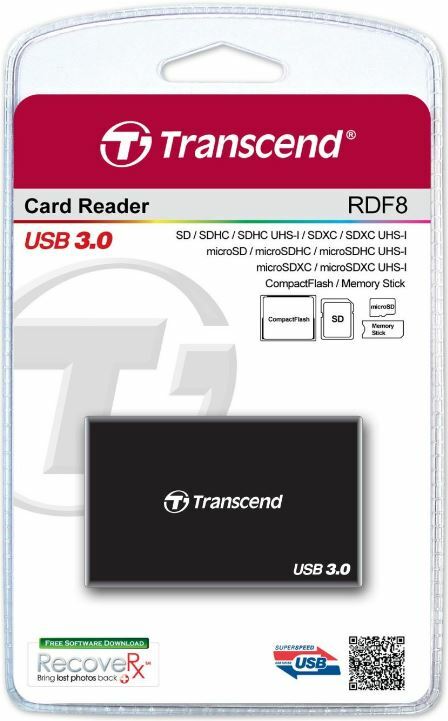 Transcend’s card reader supports every common memory card format on the market. MicroSD as well as SDHC and SDXC are supported with their own independent ports along the top let you plug in either SD format without carrying around an adapter in most circumstances. Compact flash has its own port along the bottom, giving you options for pretty much any modern card. The only consideration is that high capacity cards are only supported in the large SDXC port. If you are using a 256gb or larger MicroSD card, you’ll have to have an adapter on hand to use the larger port. This probably won’t be an issue for most people, as these cards are rare and expensive. Should you need one, however, you can simply leave the adapter in the large port at all time, only removing it when you need to access a full size card. The card reader is compatible with most common formats of high speed SD cards. This includes the zippy UHS-1 format, as well as UDMA7, and MSXC cards. This allows for a total bandwidth of about 150 MB/S on the faster cards. This means that it’s not the fastest reader on the market, but still significantly quicker than most external hard drives. The look of the Transcend Multi-Card Reader is strikingly utilitarian. It’s easy to use, portable, and reasonably compact. However, there is no other way to describe the visual appeal of the reader other than “unassuming”. Just like communist architecture, Transcend kept the design simple. They arranged the ports according to what would be easiest for consumers to use, and didn’t add any other visual elements. It’s simple, and looks like any other card reader on the market. 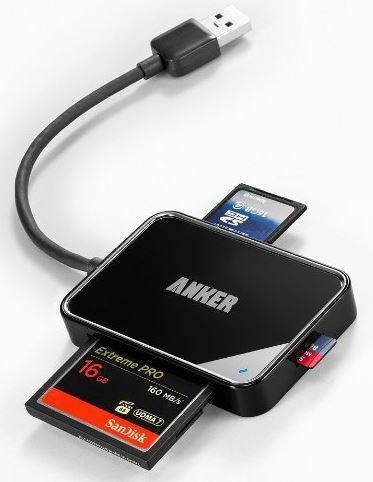 While Anker isn’t particularly well known in the portable storage market, they are very well known as a peripheral manufacturer. Anker makes products that are affordable, reliable, and portable. Although this memory card reader has the same external design as the previous generations, there are some serious upgrades under the hood for consumers who require near instant access to their data. 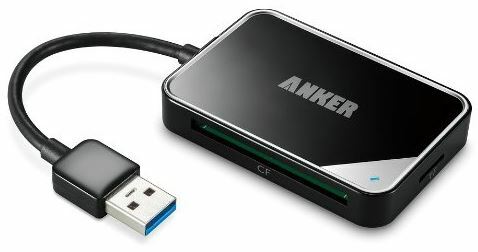 This Anker 4-Slot Card Reader supports MicroSD, Compact Flash, and SD cards right out of the box. There is a dedicated port for each type of memory card. But the ports aren’t the only thing that’s dedicated, as each reader has its own individual channel. This means that you can simultaneously read and write from all three card at the same time, with a fourth channel dedicated to transferring data between them. This card reader also doesn’t require any additional power supply. You can run it exclusively from your USB port, saving you from having to find another plug and run cables everywhere. Just like the Transcend reader, cards with a speed of up to UHS-I are supported. However, because there are up to four transfers that can take place at one time, the USB port is rated for the full 5GB/s supported by the USB 3.0 standard. While this isn’t the fastest reader on the market, very few people have UHS-II cards so this should suit most users’ needs accordingly. Anker gave this card reader a simple, appealing design. While black plastic doesn’t seem particularly flashy, the polished top and slick looking logo really add a futuristic touch to an otherwise simple card reader. Where the real design elements come into play is the portability of the device. The USB cable is attached, and very compact at only 0.4 ft. This means that you’ll never lose the cable, and it’s easy to cart around while you’re on the go. This design lends itself particularly well to laptop users, as you’d have to have it dangling off the front or back of a desktop. So, Which High Speed Memory Card Reader Should I Get? If you’re just looking for a simple card reader to transfer your family photos once a month, any of these readers would suit your needs. However, depending on your usage case one may be better than the other. If you’re a speed demon, Kingston Hi-Speed Media Reader is absolutely the best choice. This card reader is among the fastest on the market, with speeds approaching that of high end SSDs. It’s important to remember, however, that the transfer rate will only be as fast as the card you use with it. If you’re just using standard SD cards, this reader might be overkill. 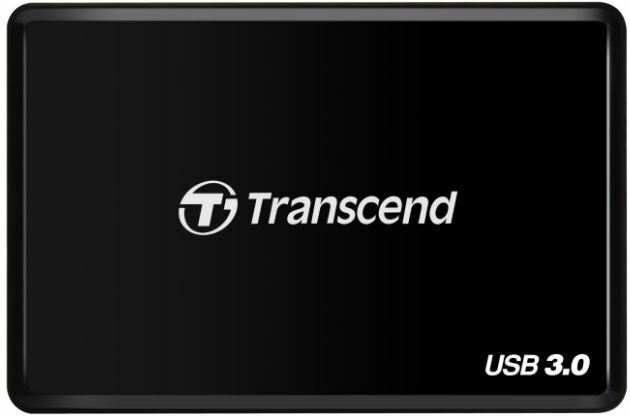 For the budget minded consumer, the Transcend USB 3.0 Super Speed Multi-Card Reader offers unbeatable value. There are very few readers on the market sold at such an affordable price. 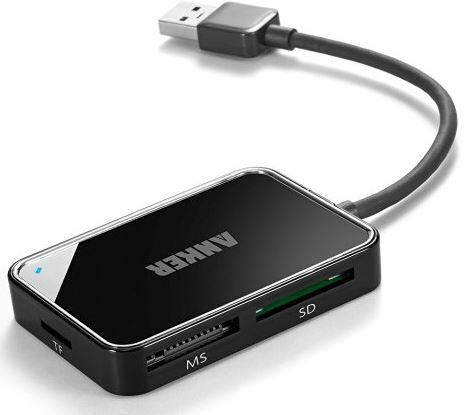 If you’re on the go, consider the Anker USB 3.0 4-Slot Card Reader. This reader is ultra-compact, and includes a built in USB cable. This means that you’ll never be caught without a cable, and the easy to carry design lets it slip right into your pocket. If you’re all about design, the Kingston card reader is absolutely the most attractive on our list. It would look great when paired with the latest MacBook pro, or one of HP’s media notebooks. Rest assured, no matter which choice you make every one of these card readers will give you high speed access to all of your media files.